Get the fastest connections possible. We’re talking three-times faster performance for your 802.11n clients – not to mention your 802.11ac clients, which can go up to 1.3 Gbps. Multifunctional 220 series wireless APs deliver gigabit Wi-Fi performance to 802.11ac mobile devices. 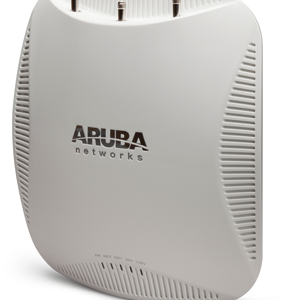 Integrated Aruba ClientMatch™ technology ensures consistently high performance across the WLAN infrastructure. With a maximum data rate of 1.3 Gbps in the 5-GHz band and 600 Mbps in the 2.4-GHz band, 220 series APs are three-times faster than 802.11n APs and provide performance similar to a wired connection. The 220 series APs include ClientMatch™ technology, which eliminates sticky clients by continuously gathering session performance metrics from mobile devices. This information is then used to steer each mobile device to the best AP and radio on the WLAN. Proactive and deterministic, ClientMatch dynamically optimizes Wi-Fi client performance as users roam and RF conditions change. If a mobile device moves out of range of an AP or RF interference impedes performance, ClientMatch automatically steers it to a better AP. With ClientMatch, 220 series APs load web pages faster, deliver video streams with improved quality and support high densities of mobile devices. An 802.11ac network without ClientMatch performs no different than an 802.11n WLAN. The 220 series APs additionally support priority handling and policy enforcement for individual Microsoft Lync media on the same device, including encrypted videoconferencing, voice, chat and desktop sharing. Adapts to available 802.3af power-over-Ethernet (PoE) instead of requiring customers to upgrade to 802.3at PoE+. Delivers 1.9 Gbps aggregate throughput. ­EtherChannel link aggregation on two Gigabit Ethernet ports provides 1.9 Gbps aggregate throughput. 600 Mbps in the 2.4-GHz band. Integrated Adaptive Radio Management™ technology manages the 2.4-GHz and 5-GHz radio bands and ensures that APs stay clear of RF interference. Capable of part-time or dedicated air monitoring, the spectrum analyzer remotely scans the 2.4-GHz and 5-GHz radio bands to identify sources of RF interference. Wireless mesh connections are convenient where Ethernet drops are not available. Integrated wireless intrusion protection offers threat protection and mitigation and eliminates the need for separate RF sensors and security appliances. With an OpenDNS service subscription, Aruba Instant APs delivers integrated web filtering, malware and botnet protection to every device connected to the WLAN. Encrypted IPsec VPN tunnels securely connect remote users to corporate network resources. SecureJack-capable for secure tunneling of wired Ethernet traffic. 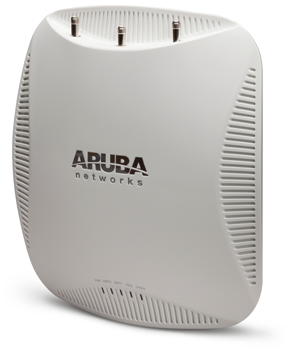 Controller-managed AP or Remote AP (RAP) running ArubaOS™. 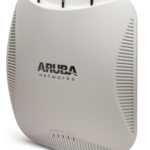 When managed by Aruba Mobility Controllers, 220 series APs offer centralized configuration, data encryption, policy enforcement and network services, as well as distributed and centralized traffic forwarding.